It can be applied directly to skin for treating wounds. People used to apply the horsetail paste over the wound area or make tea to apply over the injured area. Leaving this at the site of the wound assists in a quick recovery and prevents infection due to its beneficial phytochemicals. It is a great natural remedy for treating issues such as kidney and bladder stones, and urinary tract infections while improving overall health. Horsetail extract can also reduce the water retention in the body which normally causes oedema. It contains many useful components such as silica and potassium which helps in regenerating body tissue along with collagen synthesis. Due to collagen formation, the quality of the skin, hair, and nails improve. Horsetail promotes glowing skin, shiny hair, and beautiful nails. Due to its strong antioxidant and anti-inflammatory potential, horsetail can reduce muscle and joint pain while reducing the symptoms of inflammatory diseases. Does it promote hair growth? If your hair is thinning day by day, this could be a result of having a mineral deficiency. In this case, horsetail extract works miraculously as a natural treatment for hair growth. It is best for hair growth because it has a great number of vitamins and minerals that assist in healthy growth. One mineral that is found within this herb is silica which promotes healthy hair. Silica also improves nail growth and bone density. It helps in strengthening the hair strands which not only improves the hair growth but also provides shine and texture. Sometimes selenium deficiency may occur which causes hair loss, but horsetail extract contains selenium which promotes hair growth if taken on a daily basis. The antioxidant potential of this herb prevents aging due to metabolic stress. The other constituents are saponins, flavonoids, alkaloids, and salts that help to bring balance to your body. How to take horsetail supplements for hair growth? Horsetail supplements are great for achieving the thick and healthy hair you’ve always wanted. It is available in many forms such as a pill, capsule, and liquid extract. The safe dose is about 300mg and should to be consumed three times a day. Taking horsetail extract in the form of a pill or capsule is easy because it doesn’t need preparation or application time such as oils. The oil can be applied directly to the scalp because it is safe and doesn’t cause itching or burning sensation on the skin. This increases the direct absorption of extract in the skin and promotes hair growth. The other method of taking horsetail extract is to use it in the form of infusion or tea, which provides less amount of extract as compared to the oral method. 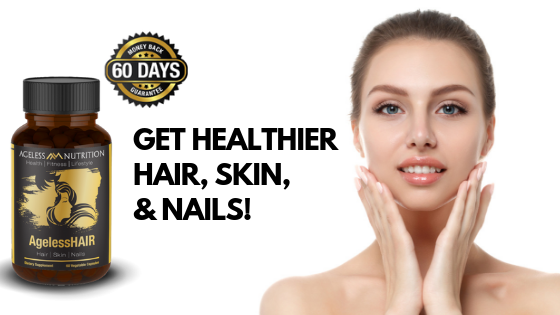 These days there are many oral supplements in the market which not only contain horsetail extract but also other vitamins and minerals to provide an all-in-one solution for healthy hair, skin, and nails. Our product AgelessHAIR is an all natural product that is made right here in the USA. We have created a unique formula that includes premium ingredients to provide you with the best results. We are so confident in our product that we offer a 60 day, money back guarantee. It is a safe and natural way to promote hair growth without any side effects. But as always, please make sure to consult with your doctor before taking another supplement.